Organizing for Action and My Barack Obama ask young people to talk politics over Thanksgiving dinner. President Obama pardons substandard insurance policies for one year. Organizing for Action’s YPPM Erin Hannigan wrote to the Reader today urging young Americans to raise the level of discourse around the traditional Thanksgiving table as families gather across the nation this week. Hannigan outlines a bold Thanksgiving campaign for the White House, taking the battle for ObamaCare into every home where a Young Obama Supporter is invited. Ah, the week of Thanksgiving—that beautiful time of year when families gather and parents everywhere feel the need to complain about taxes, government regulations, and the latest ObamaCare fees and cancelations. You’re a precocious child. Folks at the dinner table look to you as a voice of reason on all subjects. They have jobs, and finances to take care of. They don’t have time to read up on the latest minutiae of why Ted Cruz hates America, or why those dastardly insurance companies are canceling their policies and blaming it on ObamaCare regulations, forcing them out of those substandard policies. So, this year, be prepared when health care comes up. Which it probably will, because if you’re eating Thanksgiving dinner you’re the product of privilege and your family’s health insurance has just gone through the roof due to ObamaCare’s higher standards. For millions of Americans, this is the first time that quality, affordable health care is trapped within a failing government program. But as long as they have the money and can navigate the web site, getting covered is easy. That’s why you should take the time to talk to the people you love less than President Obama about what health reform means for them. Sometimes its easier to just let all those complaints go without getting involved—believe me, I know. My father’s health insurance went up $1,200 a year. But remember, anyone who loves their father or mother more than President Obama is not worthy of him. Before you get together with your family, be sure to stock up on tips for talking about the President: just go to the My Barack Obama web site and choose The Talk About the President’s Health Care—It’s Better Than Yours! It has all you need to start a conversation about ObamaCare. And don’t worry, we promise that the Barack Obama web site is easier to navigate than HealthCare.org! Also, if you have aging relatives, Thanksgiving is a wonderful time to discuss euthanasia and the billions spent on unnecessary medical procedures for the elderly. 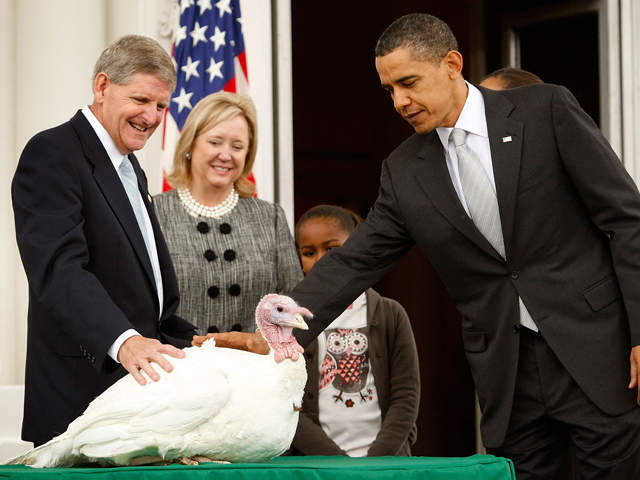 President Obama outlines Thanksgiving campaign last modified November 25th, 2013. Copyright © 2019 Leni Films.